The Slow Colour Project experiments with the relationship between colour and smell. Working with the ongoing Folds to Infinity Collection (2005-), a textile work composed of an infinity of connectible cuts of fabric, the Slow Colour Project invites the public to participate in a collective dyeing of the textile with spices. 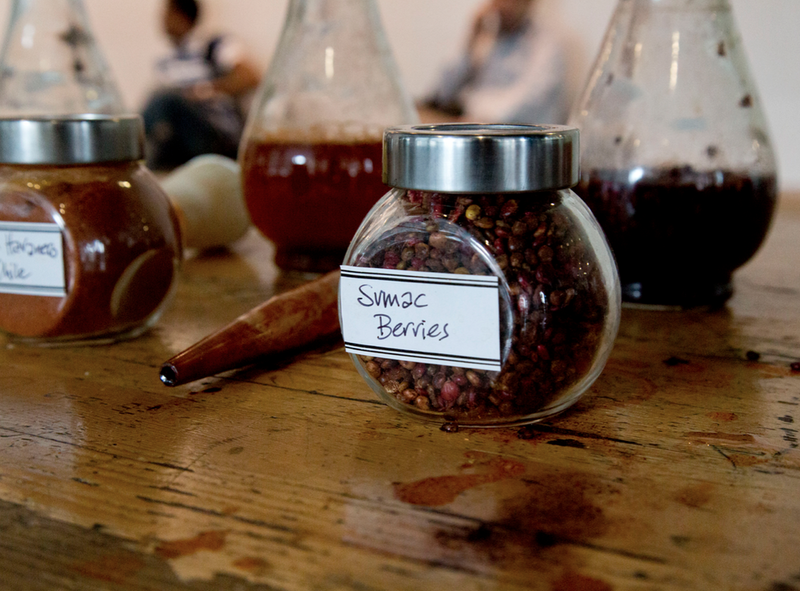 In this iteration of the work, all the spices will come from the Americas, producing many variants on the smell of red. 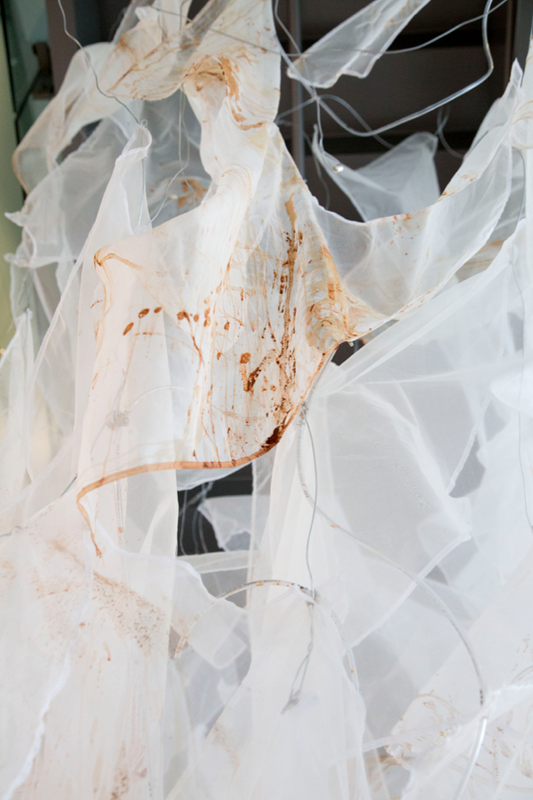 Using the dyed fabric, participants will also be invited to fold out environmentally - create a mobile architecture - or fold across relationally - create garments. The proposition: a synthesthetically-inflected experience of taking and making collective time. The Slow Colour Project is a research-creation project that explores the relationship between colour, perception, movement and time in the context of a participatory installation event. Like my earlier project Slow Clothes (2007-2009), it is influenced by the Slow Food movement. I am interested in the Slow Food movement’s focus on the quality of time shared, in particular its emphasis on creating propitious conditions for the creating of collective environments. The Slow Colour Project’s aim is to create a participatory environment that revolves around a slow process of spice-dyeing through which the aesthetic environment is transformed through colour and smell. 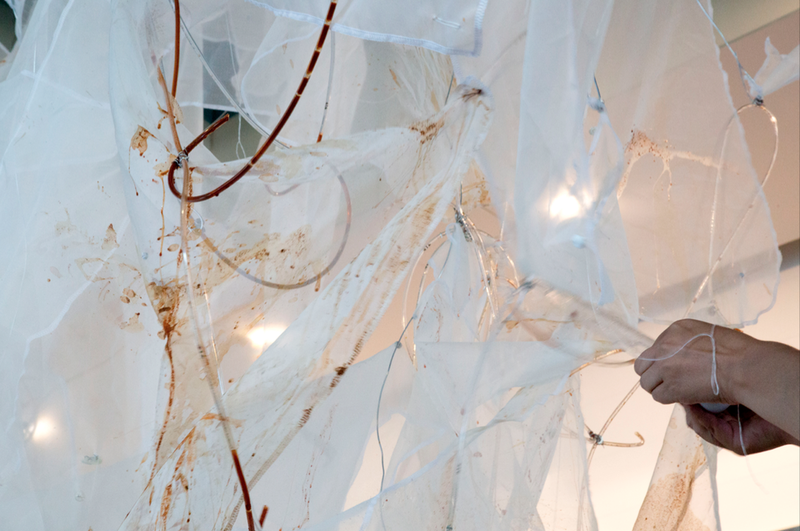 A second stage of the project involves using the technique of subtraction cutting to create a participatory garment-making proposition using the dyed fabric. As in Stitching Time (Sydney Biennale, 2012), the invitation to craft garments will be open to participants. For The Slow Colour Project, I propose to sew transparent tubing approximately 5mm thick into an array of 50 cut and serged pieces of fabric, conducting not electricity but colour and smell. The material is unbleached organza and it hangs in the space in an aesthetic similar to that used in the Folds to Infinity collection. These tubes will be sewn in clusters across the pieces, each cluster dedicated to a colour/smell. Dyes, created with spices, will be pushed through the cables which will be punctured to allow the liquid and the smell to seep through. A pump system will be created to allow participants to move the dyes through the tubing over the period of the installation event. 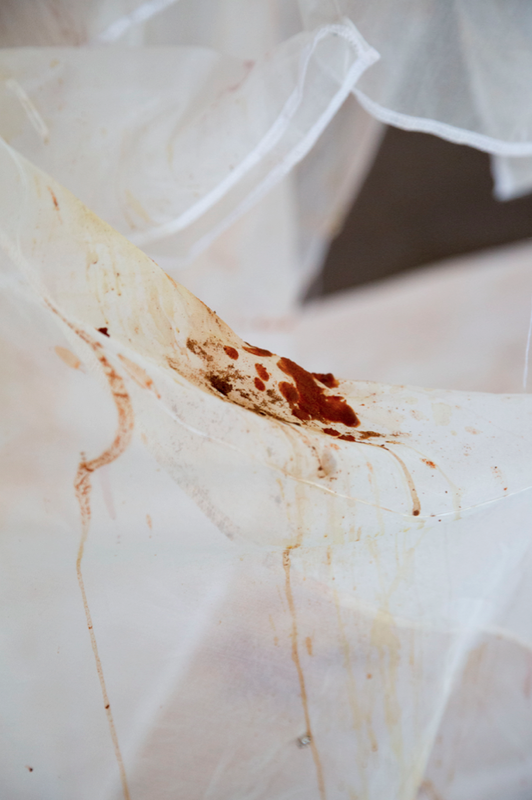 As the dyes move through the tubing and leak onto the organza, they will leave traces of colour and/or smell. These traces will leak onto the floor, which will be covered by large uncut pieces of the same organza. This organza will eventually be used as a proposition for collective garment design. The research into the process of dyeing will seek to connect into local immigrant populations, particularly those whose contact with spices is rich with history (East Asian, Iranian, Middle Eastern). 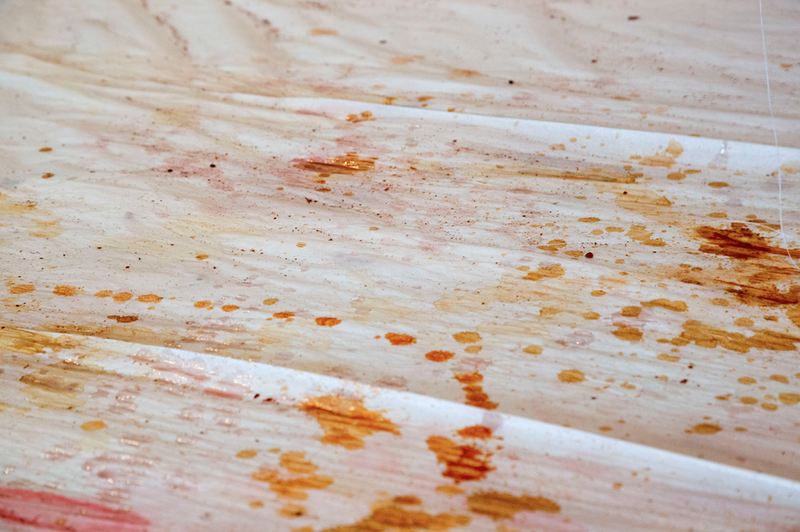 After collecting local knowledges, I will collaborate with Pakistani artists Usman Ilahi and Imran Qureshi, who have invited me to participate in a residency in Lahore on the techniques of vegetable and spice dyeing they have been using in their practice. In this period, I will also research the geo-political consequences of spice trading and the role spice has played in dyes. My goal for the artwork itself is less to make colour-fast dyes than to experiment with a processual system that activates smell and colour over time. As with the earlier project Slow Clothes, The Slow Colour Project builds on the commitment to take, give and share time, taking the Slow Food movement as its inspiration. 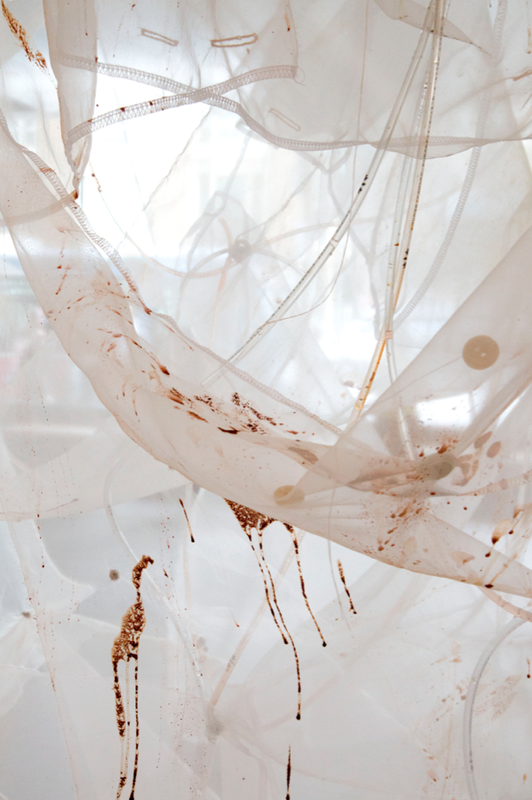 Over a period of at least 4 weeks, the installation will slowly shift from the neutral canvas of the unbleached organza to the sensuous experience of colour-smell spreading over the fabric. This slow spread will be complemented by the fabric on the ground also slowly changing colour. The participatory component involves both active and more passive participation. Before entering the environment, participants will be asked to take off their shoes, after which they will be welcome to walk over the silk, sit on low benches within the fabric installation, have a cup of tea (also made with spices) and contemplate the shifting landscape. Should they wish to sew, they will be invited to pull buttons out of vats of spice dyes to sew them onto the fabric, thus leaving not only the mark of the button sewed, but also their fingerprints and any splashing that inadvertently occurs. The thread used will be the same ochre thread used throughout the earlier Folds to Infinity collection (www.erinmovement.com). The needles will be pre-threaded with 2 meters of thread and there will be no cutting implements. A participant who sews a number of buttons will therefore do so without any interruption of the thread, creating a constellation that will later be key to how the subtraction cutting technique will be implemented. All of this takes time. Once the subtraction cutting has occurred, the uncut thread as well as the buttons and buttonholes will facilitate the process of connecting the pieces to make a garment. As with Stitching Time (18th Biennale of Sydney, 2012), I will be present for the duration of the exhibition, serving tea and assisting people in the fashioning of garments, and the garments created will be given to the participant. Experiencing the slowness of an environment coming alive through colour and smell is seen as an invitation to participate in the transformation not only of the installation-event itself, but as the creation of a collective environment that shares an ethos of giving time.